Kip Kelly had a long relationship with hockey in the St. Vital area. From September, 2000, until his sudden passing on January 12, 2004, Kip was the beloved Equipment Manager for the St. Vital Victorias Major Junior Hockey Club. He was appreciated for his good humour, hard work, and absolute devotion to the players and team. Kip was a friend to all and will be greatly missed. 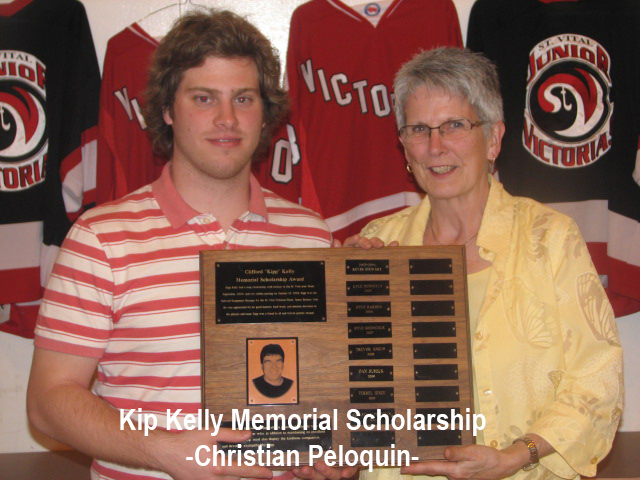 This $500 scholarship award, put forth by the Kelly family in honour of Kip, is presented annually to a Junior Victoria player, who, in addition to maintaining excellent scholastic standing, must also display the kindness, compassion, and devotion exemplified by Kip Kelly. Jim is a long time executive member and inductee into the Vics Hall of Fame. Jim sponsors a scholarship awarded each year to a Victoria player to further his education. Rick Cancilla was a St. Vital resident who played his minor hockey in the Vics' AA program. Rick played three years with the Major Junior Club from 1988-91. At only 5’9", Rick was a quick forward with a natural scoring ability. He will always be remembered for his reputation as a team player, and for being a winner. Tragically, Rick passed away as a result of an automobile accident, September 2, 1995. Beginning in 2011, the Cancilla family has put forth a $1,000 yearly scholarship in Rick's honour. The scholarship is to be presented to a Junior Victoria player who demonstrates outstanding academic achievement, coupled with excellent leadership skills. Myles Marchenko spent the majority of his hockey career in St. Vital. None of these times were more memorable to him than his final year with the Junior Victorias when they captured their first and only Championship title. People knew him as an intense competitor and a protector with the heart of a lion. 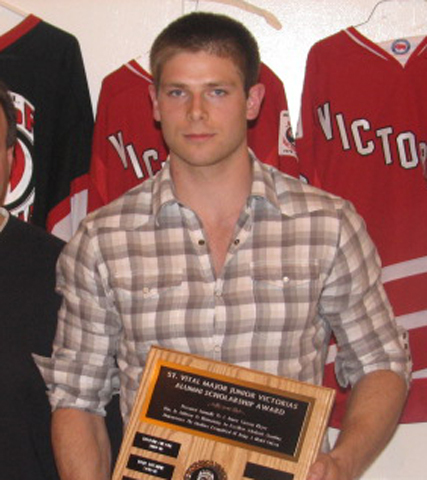 During his time with the Junior Victorias he forged bonds with teammates and fans alike that he held close to his heart until his passing in 2009. 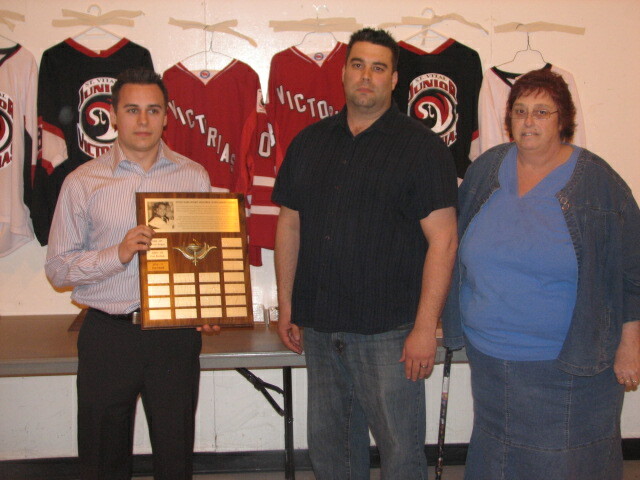 This $250 scholarship, donated by the Marchenko family, is presented annually to a Junior Victoria player who exudes the same determination and dedication that Myles did every time he stepped on the ice. Additionally, this individual is dedicated to the pursuit of continuing education and self betterment. 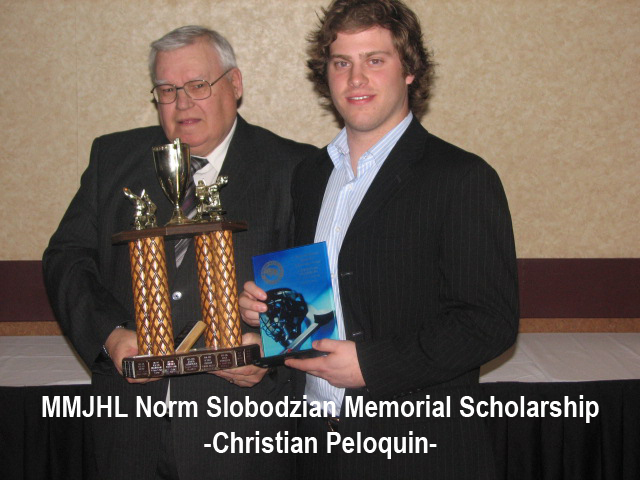 Beginning in 2010, in appreciation of their time spent in the program, and in recognition of the commitment required to play junior hockey, members of the St. Vital Major Junior Victorias' alumni have put forth a $250 scholarship. The yearly scholarship is awarded to a Junior Victoria player who has achieved excellent academic standing as a full-time student, all-the-while being fully committed to the hockey program.